My dear husband planned a holiday for this week that he wouldn’t tell us about. I suspect it was because it was an outing I would purse my lips about, and he was kind of right. I guessed it was a houseboat when he said there would be no power points and a gas fridge, and when he started collecting together fishing gear. The first thing I thought when I saw it was that I should have brought more alcohol. Then I wondered which child I’d be compelled to throw overboard first? But after we’d talked the office into giving us more pillows and doonas and toilet paper, it started looking quite cosy. “What do you think?” asked Captain Casey (actually, he’s a Lieutenant Colonel). “Aargh, I should have brought rum”, I said. “And a parrot”, added the Horror. 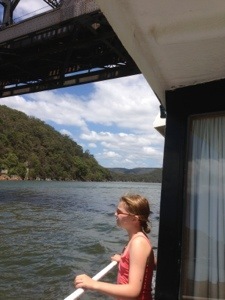 There are plenty of nooks and crannies in which I can hide from the kids on the boat. The kitchen is far better equipped than the cabin at our last holiday. I’m looking forward to seeing my plus six foot husband cram himself into the minus six foot bed. We’ve just done a circuit of Dangar Island, which looks very pretty but would be an annoying commute. Now we’ve stopped to fish, and I’m wondering how long it’s going to take the kids to notice the rocking motion of the stationary boat and throw up. They’re fairly excited about possibly catching something edible, or a jellyfish, so may not. It doesn’t bother me. It may not be so bad after all. Aargh, me hearties.